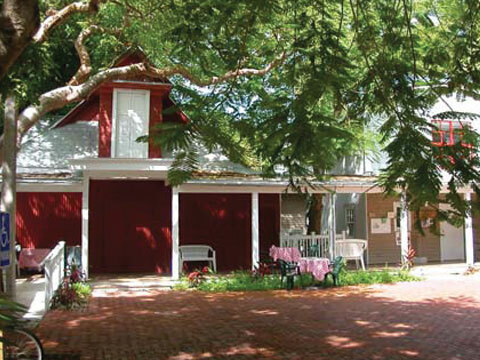 Originally the carriage house for Key Westâ€™s Oldest House, circa 1829, the little Red Barn seemed destined for a theatrical future. When the advent of the automobile made its use obsolete, the Barn was adopted by the Key West Community Players, who offered a lively variety of plays on its stage throughout the 40â€™s. After World War II, when the Community Players had moved to their beautiful Waterfront Playhouse at Mallory Square, the Barn was dusted off again by Ruth Guttman, who, with her husband Yehuda, presented wonderful puppet shows during the late 60â€™s and 70â€™s. Yehuda, a gifted concert pianist, also offered many concerts on tropical evenings at the Barn. After a period of dormancy during the 70â€™s, a spirited group of actors and technicians renovated the theatre, opening the doors of the Barn in 1980 under the incorporated name of The Red Barn Actors Studio, Inc. As the Barn has prospered and grown into a cultural cornerstone for our community, we have picked up the mantle of literary heritage that Key West has to offer by utilizing the great talent resources available to us: Richard Wilbur, former Poet Laureate of the U.S., worked along side us in our productions of his Moliere translations; Shel Silverstein many times gave us carte blanche with his work; others include Jimmy Buffett, Philip Burton, Jerry Herman and in the early days, Tennessee Williams. The Barn received its first funding from the Monroe County Tourist Development Council in 1983. Grant support from the State of Florida Division of Cultural Affairs followed with its first award in 1985. The State continues to support the Red Barn and this year the Barn rated in the top 5 Florida Theatres in the state for its budget size. The strength of the Barn lies in our commitment to quality theatre and community involvement. To all our patrons and supporters and to our many visitors from far away places we welcome you. Enjoy the show!